Osaka – the second largest city in Japan. Geographically – it is just in the middle of the main Japanese island of Honshu. The favorable geographical position of the city was one of the reasons for turning it into a thriving commercial center. 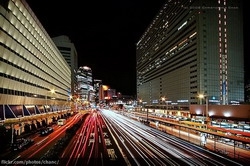 Osaka is one of the largest commercial centers of Japan. The picturesque town give multiple channels (called Osaka Japanese Venice). 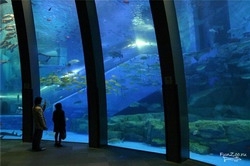 Aquarium “Kayukan” – he is recognized as one of the best in the world! There are more than 500 species of marine life, including whale sharks. The museum-aquarium “Kayyukan” has a unique location – the area is called the “Ring of Fire” due to the fact that volcanic zone located on the perimeter of the Pacific Ocean, forming a kind of circle. This is a real home for fish, one of the world’s largest and has 580 varieties of them, as well as many mammals, birds and reptiles. Here is how the animal and plant world of continental and island shores, overlooking the Pacific Ocean. Aquarium holds 13.5 million liters of water. You will go down to 14 levels populated by fish and mammals. 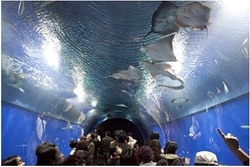 Central tank – 9 meters deep, with a whale shark is the main exhibit of the aquarium. Visit the aquarium starts with 8 floors and everything is coming down floor by floor. Aquarium itself is located on a beautiful seaside promenade, where you can take pictures and marvel at the Japanese reality, because Osaka – is the embodiment of modern Japan, which is heading into a dynamic future. All this creates an especially rapid pace of city life, which is also called “Japanese cuisine”. So it came to be called not only for the constant restlessness of its inhabitants, but also for the fact that in many restaurants, can be very tasty and varied food. 13:00 – Lunch at a local restaurant. The guide will help you with a choice of dishes. 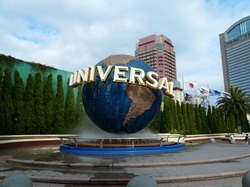 14:00 – After lunch you waiting for the next stage of your journey, even more amazing – you see of Universal Studio, Japan . Opened in 2001, this theme park is designed for people of any age.You will visit the 9 thematic areas, as well as “live” entertainment on the streets and in restaurants. The concept of the park is based on stories of famous films and fairy tales. You will enjoy a 3D and 4D design. Spiderman’s waiting for you, Terminator, Shrek, slides – the phenomenon of the Hollywood Dream, Water World, Jurassic Park and many other attractions.There are restaurants and shops. 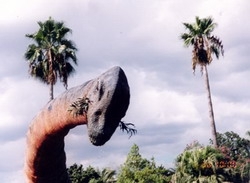 Universal Studios Japan is one of three theme parks Universal Studios, and the first outside the United States.